Less is More - Thyme Lacque. 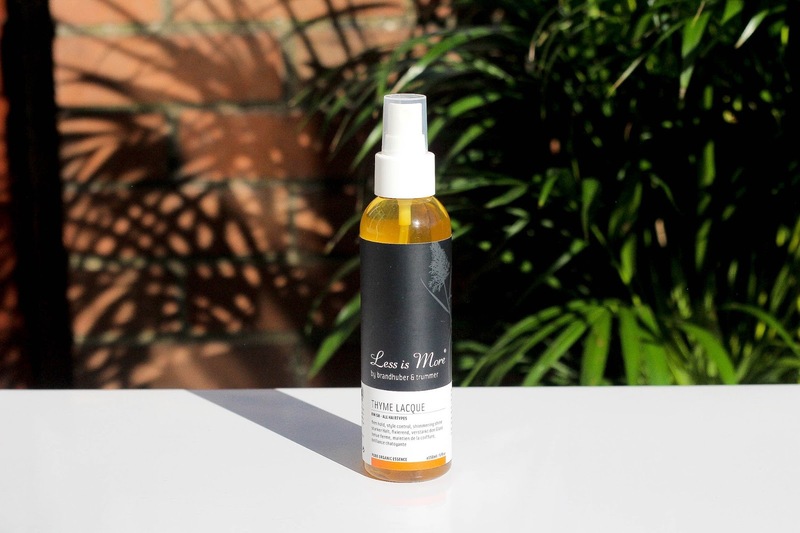 This hair styling product caught my eye because it's an organic styling spray Less is More - Thyme Lacque'Firm hold / Style control / Shimmering shine'. It's basically a hair spray with no throat and chest coughing ingredients. Yup, totally free from gases. Good for you, the others around you and the environment. ‣ Shellac - A natural film former, gives your hair a strong hold and beautiful shine. ‣ Fair Trade Mascobado - Traditional whole cane sugar from the Philippines. Mascobado is the dried, unrefined juice of the sugar cane. Made using organic production and imported through Fair Trade. Contains valuable minerals including calcium, magnesium, zinc, iron, phosphor and give the hair form and a strong hold. ‣ Forest Honey - precious forest honey from natural reserves in the Upper Austrian Mühlviertel brings moisture, nourishes and cares for hair and scalp. ‣ Sicilian Bergamot - Essential oil from expression of the fruit peel. Mood brightening, refreshing and balancing oil. Has antibacterial, toning, immune-stimulating and antioxidant effects. It also has glycerin, which is a natural humectant, therefore it draws moisture to the hair keeping it from drying out. So much nourishing and natural ingredients while giving you the benefits of a gas induced hairspray while being natural. It's sprayed on dry hair and then you can style shortly afterwards but for me it's all about holding my hair in place whether straight, braided or in a bun/ponytail and at the end of the night when I brush my hair there's no 'hard case' to break which means no dryness, flaking or crispy feeling. It's not a cheap alternative with some prices from online retailers being between £18-£22 for the full size 150ml but I've found it for under £6 for 50ml and if you're like me and only need a few spritzes and not daily, that'll last. Less Is More Available Here. Ever tried a natural hairspray before?